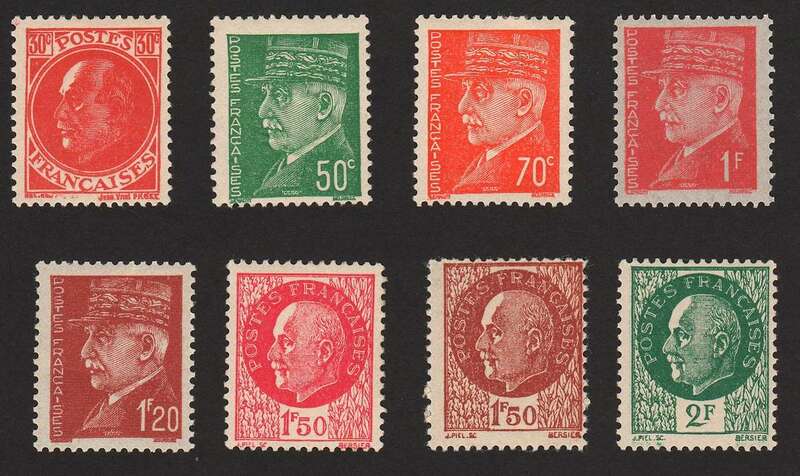 I'm working on my collection of British forgeries of French stamps used in German-occupied France during WWII, and when I display them on my website, I'd like to display the forgeries side-by-side with the originals. But, I don't collect France, so I don't have copies of the originals. If you can help me out, please let me know and I'll find a way for you to send me the scans. They'll probably be too large to e-mail. PostmasterGS, are you looking for these stamps to be in mint or used condition? Preferably mint. I'm attempting to show the distinguishing difference in the design/printing, and I don't want the details obscured by a cancel. Sorry PostmasterGS, I've been out of town. I think you already got Scott #360, 361, and 382. I can provide all the rest. If you still need them, let me know. I can email them one by one. Do you want them on white, off-white, or black background? Wow! Thanks! I do still need the rest. You can try e-mailing them to me one per e-mail. Black background, please. OK. I think you might have access to a program called PMGS StampFix , so I'll leave it to you to make the stamp images nice and upright. Sorry I didn't reply last night. I forgot I left my laptop charger still packed in my travel bins at the office, and my laptop battery ran out. I will scan and email when I go back home today. Heh. Yeah. No need to worry about cropping and straightening! Just to make sure the error doesn't accidentally propagate, the genuine stamps are "red brown" in Scott. I have emailed you the scan. It turns out my 30c Pétain may be an EFO with printing flaw in the upper left corner and along the printer's text -- if that is not acceptable, let me know and I'll see if I have another one somewhere. I also never bothered to check for the secret marks or perfs to see if one of the British forgeries may have accidentally worked its way in. So if by some miracle I happen to have one of the British forgeries in there, let me know! OK. Got the comparisons uploaded. You can see them here and here. Special thanks to khj and jkjblue . I'm still waiting on a couple stamps to arrive to fill the holes, then I'll post a nice show-and-tell thread covering all these issues.